Clay Aiken – Music and Skating Combined! Do you remember what Clay Aiken was doing on November 6, 2007? 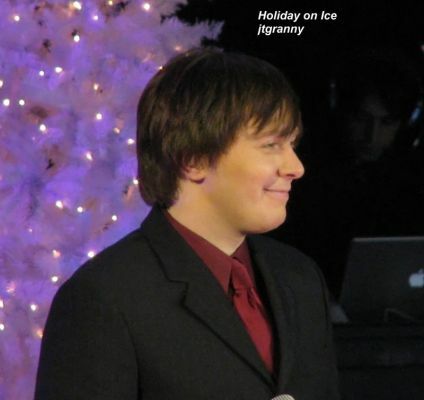 Well, he was at The Orleans Arena in Las Vegas as the exclusive musical guest on the Capital One Holiday Celebration on Ice. The show was taped on November 6th and it aired on NBC on Christmas Day. The arena was filled with fans of Clay Aiken. They flew into Las Vegas from all over the United States to see Clay perform. A large group of fans sat together in the front area and other fans were scattered throughout the arena. Clay & Cast/Couples: What Are You Doing New Year’s Eve? At the end of the show, Clay put on some skates and joined the professional skaters as the circled the rink to say good-night to the audience. Clay looked like he was having a great time. 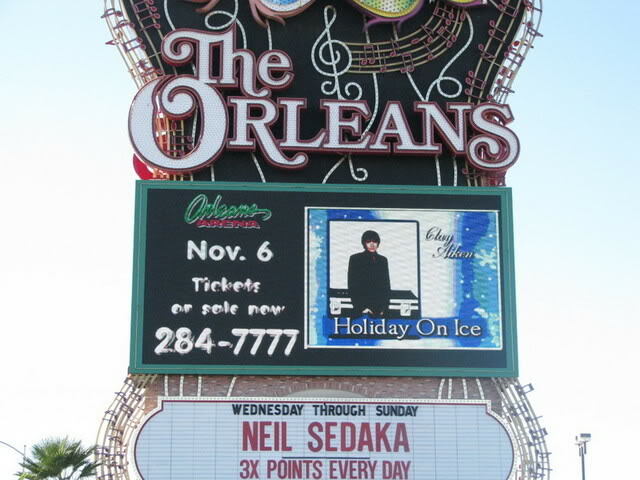 LAS VEGAS, N.V. — What better way to celebrate the winter holiday season than with cool music, Clay Aiken and world-class ice skating? The Capital One Holiday Celebration on Ice, set for Nov. 6 at The Orleans in Las Vegas, will be a star-studded evening to remember. The show will be a live taping for a Christmas Day TV broadcast on NBC. Tickets for the show will go on sale in July. Tapped as the exclusive musical guest for the Capital One Holiday Celebration on Ice, singing sensation Clay Aiken will lend his powerful voice to some of the most loved and classic holiday songs of all time. 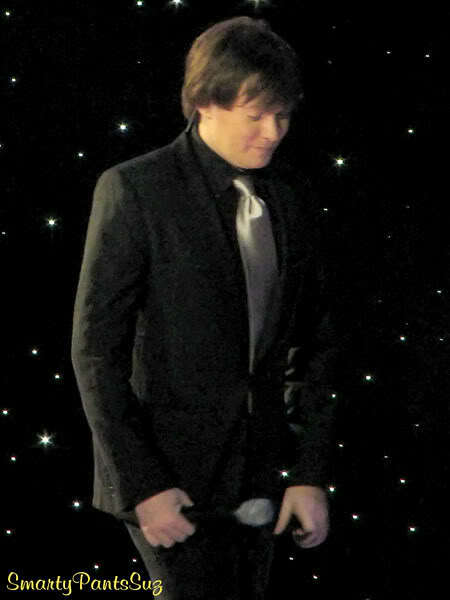 Since 2003, Clay Aiken has garnered a number of different titles. Multi-platinum recording artist, television personality, Goodwill Ambassador for UNICEF (visiting children in war torn Afghanistan, Uganda and tsunami stricken Indonesia), best selling author & advocate for individuals with disabilities through his Bubel/Aiken Foundation. Headlining the event on the ice is the ever-elegant Sasha Cohen, a U.S. skating champion and the 2006 Olympic silver medalist. Cohen’s skating is a treat in itself, with her mesmerizing style and grace. I was lucky enough to be at this event and it was a great combination of wonderful music and exciting skating. Did you see this event live? It’s always fun to hear Clay play the piano!!!!! I have this on tape – every year around this time or maybe a little closer to Christmas I pull it out and watch it. Love the skating and the voice of Clay! Loved watching the video! I taped this program, too, and love to re-watch it during the holidays. I've never seen the video of Clay & Sasha playing the piano & 'skating' together. Thanks for sharing it. I was there, it was really great. I watched part of the program back then on tv, but missed out on about half because my family had Christmas one day early and arrived then. I didn't have a way to record it at the time. I was there too. It was a wonderful show. Clay looked w! Error: Error validating access token: Session has expired on Tuesday, 21-Aug-18 16:13:01 PDT. The current time is Tuesday, 23-Apr-19 17:41:36 PDT.